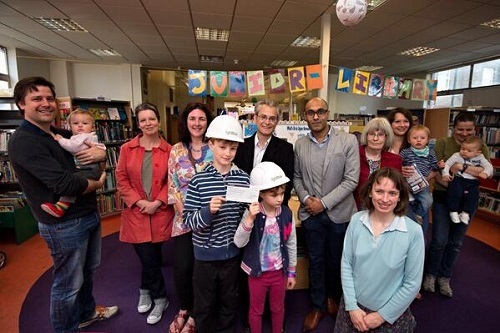 The Upper Norwood Library Trust has received £1,000 from Neville De Souza, the director of Crystal Palace-based developer Lightbox. The money was donated from the commission on art works sold at Lightbox’s elegant redevelopment of the Thicket pub on Anerley Hill, which was the venue for a number of sales of local artists’ works. The Upper Norwood Library Trust, a registered charity, has raised more than £60,000 in development and project funding and is set to take over the running of the library, which has been the victim of swingeing cuts from Croydon Council, who had funded its operation jointly with Lambeth for more than a century. Since the funding cuts by Croydon, a number of staff have been made redundant and the library’s opening hours have been reduced from five days to three days a week. Robert Gibson, the co-chair of the Upper Norwood Library Trust, said: “We are very grateful not only for this very generous donation, but also for Lightbox letting us host fundraising events in its stylish Thicket redevelopment, and committing to continued support in the future. “The local community, businesses and artists have all rallied round to support our much-loved library. We will all be looking to all local politicians to acknowledge how important our library is as a key anchor of our social and economic community infrastructure,” Gibson said. This entry was posted in Community associations, Crystal Palace and Upper Norwood, Libraries, Upper Norwood Library Trust and tagged Croydon, Crystal Palace and Upper Norwood, Lambeth, Libraries, Library, London Borough of Croydon, Upper Norwood Joint Library. Bookmark the permalink.